Join the Monthly Giving Circle! Click here to update your monthly donation. To set up a monthly donation using a checking or savings account, please send us this form. You can search above to check if your employer offers a match program. If it does, after completing your personal donation, follow the instructions here to complete the matching gift process. St. Mary's Food Bank is a 501(c)(3) nonprofit organization. *Cash and non-cash based on audited financials. Make a secure online credit card donation. All contributions are tax deductible to the full extent allowed by law. 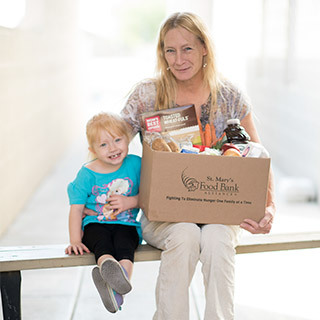 St. Mary's Food Bank exists to help feed hungry families in Phoenix and the Valley of the Sun. We are a 501(c)(3) non-profit entity. All gifts are tax deductible to the extent allowed by law.